If all you’ve ever wanted in life is a version of the Bible that swaps out all mentions of “God” with “Kanye West,” then you’re in luck. There’s one on Etsy. Each generation champions a superstar, so consistently relevant that they come to accompany that generation through its evolution, being a part of and ultimately shaping its identity. Such past icons have been the likes of Frank Sinatra, Marilyn Monroe, John Lennon, or Michael Jackson. For this generation, Generation Y, Kanye West is not only its greatest spectacle, but in some senses, a spiritual figure. We are here to spread a doctrine. Well, a pseudo-doctrine. 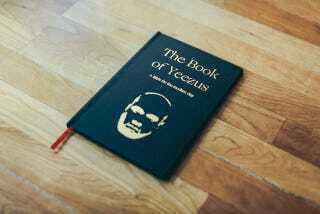 This book wasn’t made to make fun at Kanye, or really even show or undying devotion towards him. Book of Yeezus is simply an exposition. It’s adding an original twist to something ancient and important in order to capture new meaning. We are trying to cast our spotlight towards the way cultural icons have come to be the contemporary spiritual figures in our information culture.